Reload is a new platform for online recharges similar to that of Paytm and Freecharge. So, in this post you will find all the ‘latest Reload cashback and coupon codes of April 2016 in this post. Feel free to ask any doubts or difficulties. Just leave your comment below and I will be there to help you. So let us start now! Note : Visit reload.in website and then apply the codes given below. NEW 10FC: Avail upto 25 Rs cashback on your recharges above 50 Rs. Recharge your dth with 250 or more and get 50 rupees cashback. Use coupon DTH50 on or before 7 March. 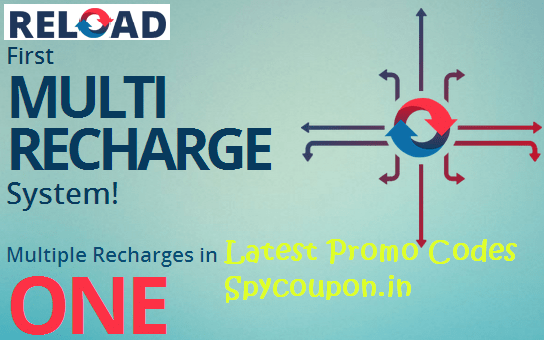 NEW RELOAD10 : Recharge for min 20 Rs and get upto 10 Rs discount. Working for all operators including Airtel. Apply promo code RELOAD50 to get 50 cashback on minimum bill payment of 500 Rs more. Next article Get Free 50 Rs Amazon Gift Card from Hike! Thank you,I got it. Reload app gave me 50 rs cash back. But the processing is too slow.